It’s barely 2 months since FKA Twigs began dating Robert Pattinson, but the couple has already engendered a passionate online response from fans. Most of these ‘fans’ are furious that Robert Pattinson would ditch his beloved Kristen Stewart for someone as punk rock and ‘alternative’ as FKA Twigs, and perhaps FKA Twigs shared their apathy. We received a tip from an insider alleging that FKA Twigs was cheating on Robert Pattinson, and now we have pictures and video that seem to substantiate the rumors. 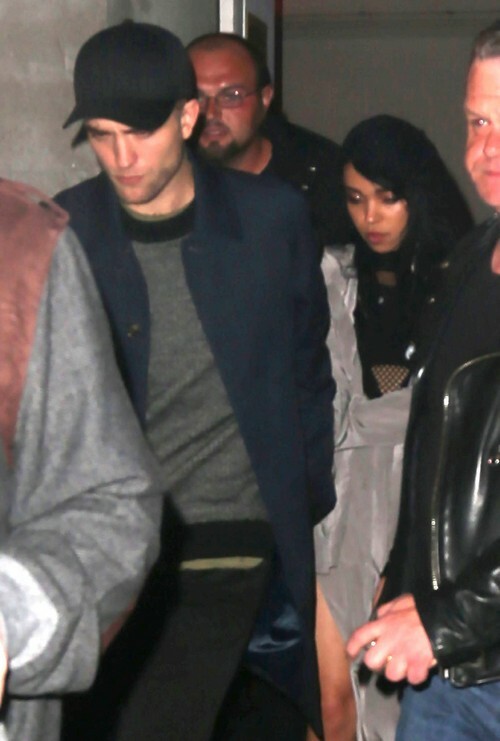 There’s no way of verifying the accuracy of these images, but one image clearly shows FKA Twigs sitting next to a mystery dude that is most definitely NOT Robert Pattinson. And in the next picture? Well, FKA and this random dude are leaning pretty closely together, and they look like they’re making out – ironically, in a very similar pose to when Robert Pattinson and Kristen Stewart were first caught kissing at a concert in Canada. Anyway, the pictures are pretty incriminating evidence, and we feel sorrier for Rob than ever. Every single serious girlfriend cheating on him? I would have developed a complex already, and refused to date anyone in the future. For what it’s worth, Rob and FKA never confirmed that they were getting serious, even though all those photo-ops did the speaking for them. For all we know, Robert Pattinson and FKA Twigs have an open relationship, and they’re open to messing around with other people. If that’s the case, then there’s clearly a reason that Robsten fans have been holding out hope for a KStew, RPatz reconciliation – and it’s because they still believe that Rob and Kristen will get back together. Oh, the delusion. I feel sorrier for them than ever, but if they want to jump to conclusions based on FKA’s cheating, let them. Plus, if Rob could go back to Kristen after she humiliated him in front of the whole world, I’m sure he can stay with FKA Twigs, who didn’t do anything nearly as scandalous. Kristen Stewart Dating Robert Pattinson: FKA Twigs Forces RPatz to Move to London, Afraid of KStew Cheating? Robert Pattinson, Kristen Stewart ‘Twilight’ Dating: Venice Film Festival Private Meeting? Robert Pattinson, FKA Twigs Dating: Kristen Stewart Furious Former Lover’s Involved In Passionate New Tahliah Barnett Romance!